Welcome back, my Cutting Edge Stencils friends. 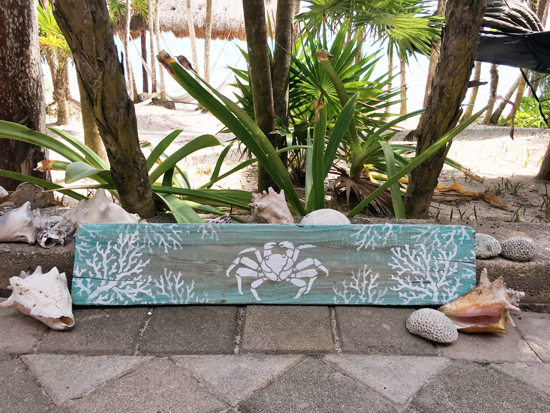 Create an exotic piece of art using driftwood and our Beach Decor Stencils! 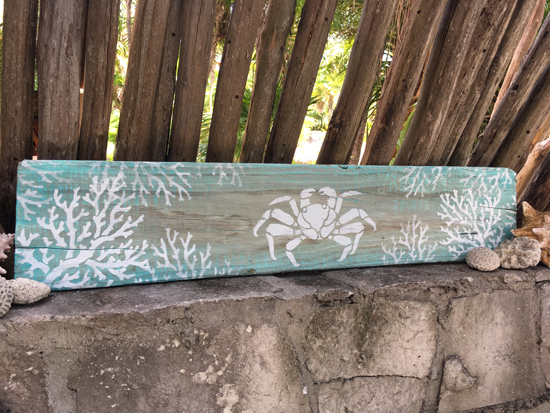 It is super easy and affordable to make DIY wall art using paint, a your favorite stencil pattern and driftwood. Today we’re sharing how you can hand-craft your own wood wall art using our Nautical Stencils. We’d like you to welcome back Greg and Janna, the owners of the Cutting Edge Stencils and two creative DIYers. 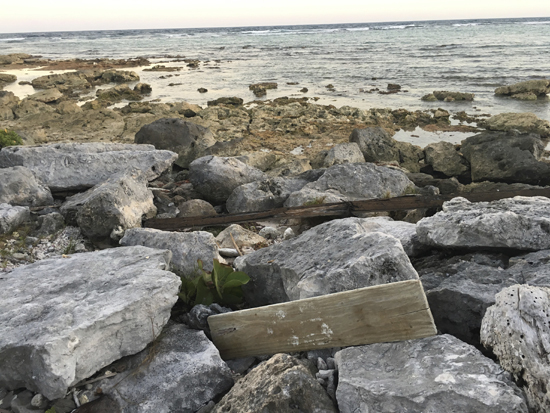 Greg and Janna recently took a trip to Mexico where they spotted a piece of driftwood. This rustic piece of wood inspired this week’s project which was fast, fun, and super easy to complete. For our visual fans, you’re going to love this stencil tutorial that Greg put together. 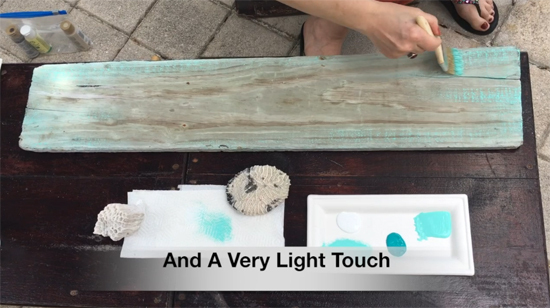 In this short video, he shows fans how easy it is to stencil driftwood art using Beach Decor Stencils. Let’s walk through the steps for completing this project. Greg and Janna found a piece of driftwood on the beach in Mexico. They knew it would make the perfect wooden canvas for their beach inspired wall art. Greg and Janna decided to select stencil patterns from our Nautical Collection. 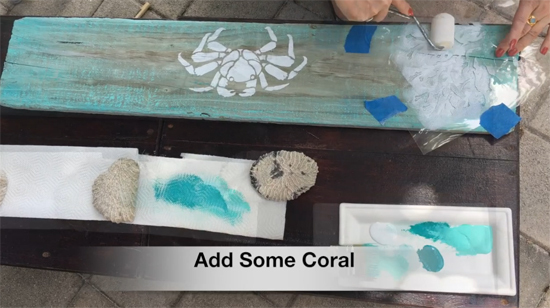 They chose the Crab Wall Art Stencil and the small Coral Stencil. These beach inspired patterns were uniquely designed but work perfectly together for a project like this. 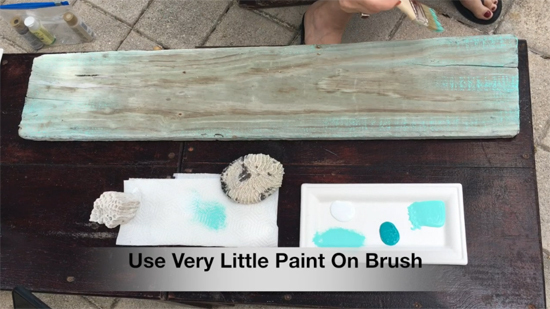 The first thing they did was dry brush the driftwood using shades of turquoise paint. Janna used very little paint on her brush and lightly stroked the wood to add a hint of color. Once the wooden canvas was painted, Janna was ready to start stenciling! 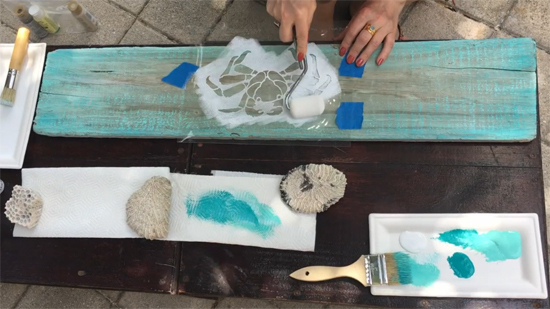 She carefully taped the Crab Stencil down using blue painter’s tape. She painted the beach crab in white craft paint using a two inch dense foam roller. If you are recreating this project at home, be sure to roll off any excess paint on a piece of paper towel. Too much paint will cause the design to bleed. 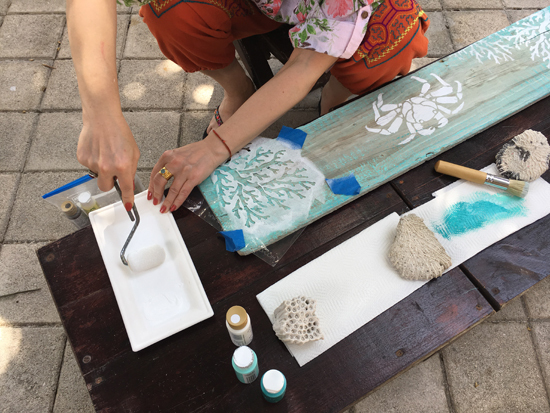 After the crab design was painted, Janna carefully removed the stencil. Then she stenciled the Coral pattern surrounding the crab. 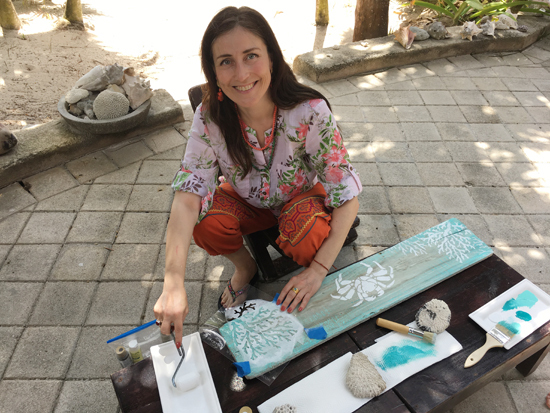 She used the same painter’s tape and dense foam roller to paint the Coral design. After it was completed, Janna and Greg stepped back to admire their beach driftwood art. Are you ready to see how it all turned out? 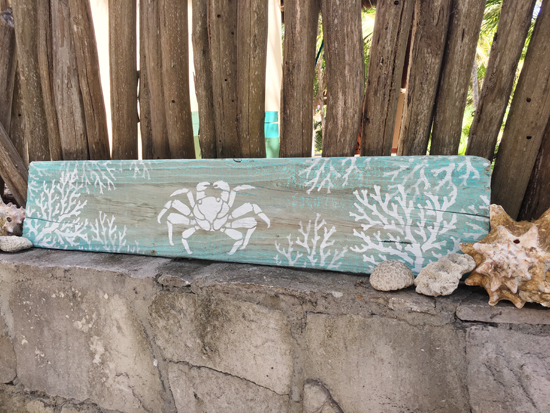 This driftwood art featuring some of our Beach Stencils is the perfect compliment to any beach decor. Tell us, which stencil design would you use on driftwood art? Leave us a comment below, we’d love to read your thoughts! Shop our Nautical Stencils and add some beachy style to your home.